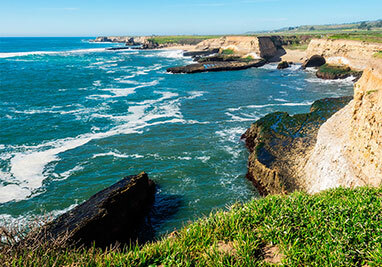 From the warm sunny beaches through rolling farmland to the redwood covered mountains, Santa Cruz county is a year round destination where the sun shines 300 days a year. The attractions and activities of the area are as varied as the landscape. Santa Cruz County serves as the gateway to the Monterey Bay National Marine Sanctuary. Kayaking and scuba diving are just a few ways to get up close and enjoy the sea lions, otters, dolphins, birds and even whales. Santa Cruz is very well known for being the home of the historical landmark, The Santa Cruz Beach Boardwalk, the only seaside amusement park on the West Coast. The area also boast an array of fine restaurants, day spas, wineries, along with art galleries and natural wildlife preserves. Beach Drive is a mile long street with about 100 homes, 1/2 of which are rentals. The first 25 are right on the beach (the island), the next group of 35 are across the street (the strip), and the last 40 (Behind the Gates, some right on the beach) are at the famous 10 mile Rio Del Mar Beach. Aptos is unincorporated and mainly residential. Price rage is $2,180 to $9,084 per week and this area has the highest selection of beach front rentals. 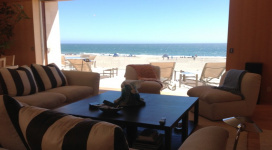 The condominiums are above Beach Drive, on the cliff in Rio Del Mar with easy beach access. Spectacular ocean views. All units have seasonal heated pools in the complex and at least one parking spot. Price range is $1,842 to $2,340 per week. Homes are within 1 to 4 blocks from the beach and most are located in Rio Del Mar Beach flats. Easy walk to beach, most with no hills, stairs or cliffs to contend with. Great value. Price range $1,110 to $2,183 per week. Santa Cruz is 8 miles north of Aptos and Capitola is 3 miles north of Aptos. 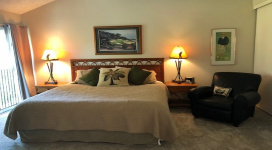 Santa Cruz homes are located close to the boardwalk, on the cliffs with great ocean views and near the Santa Cruz Yacht Harbor. 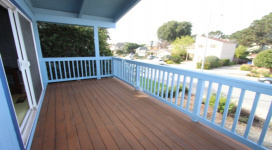 Capitola properties are located in the village of Capitola and within 2 – 4 blocks from the beach. Price range is $1,550 – $2,980 a week. This area is 1/4 of a mile north of Rio Del Mar, in Aptos and on the cliffs just over the beach. Some of the houses have ocean views above the “cement ship”. Walk down the staircase hill to go to the State Park Beach. Price range is $1,842 – $2,340 per week. These properties are in Aptos, in an exclusive area (streets on Via Gaviota are in the gated area) some right on the beach. Most of the homes available are across the street from 10 miles of beach. We also have condos and houses 3 blocks or more to Hidden Beach. Price range is $1,150 – $6,580 per week. La Selva Beach is located only four miles South of Aptos. Very quiet area and close to the beach. Cheshire Rio has vacation rentals, condos, and beach-side homes that are perfect for a quick weekend getaway or an extended family vacation! The attractions and activities of the area are as varied as the landscape. Give us a call today at 831-688-2041 to learn more. Our service areas include: Santa Cruz and Santa Cruz County, Aptos, Rio Del Mar, Capitola, La Selva and Watsonville California. Please note our prices are subjected to change with out any notice.